The Unconditional Positive Regard - The Long Term Parenting Strategy That Allows for Full Growth! • Wondering what it means to show your kids unconditional love with the unconditional positive regard? • Good! You've come to the right place! 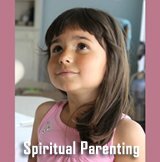 • Here you will get both an understanding of the instant healing effect and the long term benefits of using unconditional love in your parenting efforts! • Also you will get an insight into the more traditional - and short term focused - way of parenting, namely using what is called the conditional positive regard! Imagine you're back to being a kid, perhaps only a few years old. It's almost dinnertime; you're hungry and you're tired. Mom is in the kitchen cooking and you just can't settle down. You're too restless to play by yourself. You've been in kindergarten all day and the stimulus and energy is still bubbling in your body but you're too exhausted to do anything constructive with it. You go out into the kitchen and you start tugging at your mom's pants to get her attention. Perhaps you even start whining. Mom says, "Please, I'm a bit busy right now. My hands are all dirty. I'll be with you when I've cleaned my hands." Not instantly getting what you want just makes you more upset. Frustrated, your now go into to your room and you start throwing your toys around. You even break one of your favorite toys on the floor. Now Mom enters your room and takes a look around the mess you've made. She immediately goes over to you ... and hugs you. However, you're still too upset to receive your mom's hug. So you push her away. However, Mom doesn't leave you, she then sits quietly a meter or two away and looks at you. When you don't have anymore energy in your body left and stop acting out, Mom senses this and comes over and takes you into her arms. Now you finally feel relaxed, calm and secure. After sitting there for 5 minutes or so, Mom gives you a kiss and goes back into the kitchen. You're still tired but you don't feel uncomfortable anymore. It's like all the uncomfortable bubbling energy has left your body and the sea is more calm now. You feel better. You can even take one of your toys and play with it until dinner is ready. The Provocative Stance of Loving Unconditionally! This was an example of the use of the unconditional positive regard in parenting. If you treat your kids with an unconditional positive regard, it means that you show 100% acceptance towards your kids, matter how they behave and regardless of what they say. Loving unconditionally means loving your kids for what they are, not for what they do or what they don't do. This is also called unconditional parenting. Unconditional parenting means that even when your kid does something 'wrong' or is 'naughty' in the old fashioned sense of the word, you do not withdraw your positive regard. You still show your kid that you love him / her. You still show full acceptance of your kid! Well, one of the reasons is that the unconditional positive regard is extremely healing. Nothing beats the power of feeling unconditionally loved! Nothing! When we feel 'wrong', 'bad', angry, sad, frustrated, unhappy, THAT is when we really need to feel our parents' love the most. The worse we feel, the more love we crave. It's actually really simple logic! What you do is what you are! : You are rewarded for your achievements and successes and ignored or judged on your 'failures' and screw-ups! In my opinion western society today suffers from serious 'achievement' sickness which puts many people under tremendous performance pressure. We think we need to follow society's values to be appreciated. We think we need to be 'a success' to be loved. This results in working really hard to build 'honourable' careers, spending lots of money on the right clothes and inventory for our nice house, sustaining a happy marriage, having two kids as the norm prescribes etc. We will be considered either strange or a failure and ultimately we think that people will stop liking us. Now, where did this idea come from? According to Carl Rogers, the humanist therapist who coined the concept of the unconditional positive regard, many people's need to seek constant approval and admiration stems from their childhood experiences with their parents. As kids we thought that we would only be loved by our parents when we 'were good' - when we behaved in ways that were approved of by our parents - if we lived up to our parents' standards and demands. The result of this seeking our parents' approval is that as adults we still think that love and acceptance is something you have to earn, as opposed to something that is unconditionally given. So today, using the unconditional positive regard in parenting is really not that frequent. However, fortunately there are several parenting styles that philosophically embrace practicing the unconditional positive regard. Those parenting styles are, among others, positive parenting, attachment parenting and unconditional parenting. - "If I behave, I Will Be Loved!" Using a conditional positive regard is the most traditional way of exercising child discipline. It means that you have set terms and conditions for showing acceptance of your child. In this way you let your child's behavior (living up to or failing to live up to your standards) determine your level of affection. (conditional means 'depending on'). For instance, extreme examples of using the conditional positive regard in child discipline matters would be if you only showed affection and approval of your child when he or she was a success in your view. • Eats up everything on his / her plate because your parents taught you that was 'proper' table manners! • Willingly sits on the potty because the parenting books dictate that now is the time! • Is independent and able to play by himself or herself. • Wins in sports pursuits. • Comes home with good grades. Your affection is not markedly different from what it normally is. Your are authentic and true to what you actually feel - meaning that you do not 'praise' falsely to manipulate and control your child. 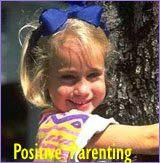 If your loving affections for your child stays on a relatively constant positive level and does not waver according to your child's behavior, I believe a positive focus can be really healthy. 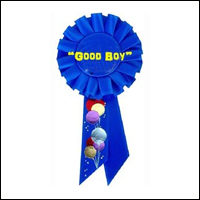 As I see it, the problem arises when we give special affection as rewards or doggie biscuits when our child succeeds in living up to our expectations. 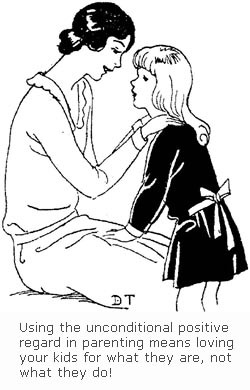 Even though you mean well, you actually 'teach' your child that he or she is only 'worth' your most affectionate attention when he or she behaves 'correctly' according to your mindset. If you set conditions for your positive regard, your child might grow up thinking that behaving and thinking in other ways than yours is 'wrong' or 'bad' - that he or she will not be accepted if he or she does not act according to your terms. This means that inside your kid's head, love and behavior will be wired together like this: "If I conform, do what I'm told, I will be loved." On the surface you, the parent, may think this is great because you get an obedient child and he or she will probably do well in school etc. But let's try to think about it more long term! 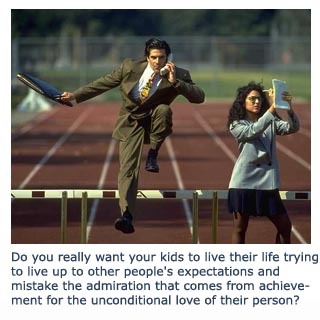 Do you really want your kid to spend his or her life working hard to constantly try to live up to other people's expectations in the hope of feeling accepted. I can tell you now, it's a lot of hard work and it has no end! I know many people who do exactly that! They work so hard to uphold an image of success that they tend to forget what actually really matters to them in life: their kids, friends, family, hobbies etc. Why Is the Reward of the Conditional Positive Regard Unsatisfactory? It's only temporary! The approval eventually dies away and you 'need' to find new way of being admired. It feels somewhat shallow because it's based on what you do, not what you are! It's only a vague shadow of what you really want, namely unconditional love and acceptance for being nothing more, nothing less but yourself! The Unconditional Positive Regard Is not Permissive Parenting! Perhaps you think that my example of unconditional parenting (the unconditional parenting example at the beginning of this article) looks like an example of permissive parenting. Well, I can assure you, it is not. I'm not at all advocating ignoring 'bad' or damaging behavior. You don't have to approve of your kid's behavior but you do need to accept your kid! Understanding this difference is the core of unconditional parenting or positive parenting! My important point is that you can actually effectively stop bad behavior or 'naughtiness' by completely accepting and showing love of your child. 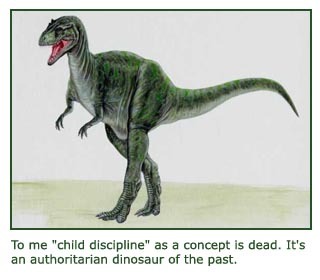 With the Unconditional Parenting, the Child Discipline Concept Becomes a Dinosaur of the Past! 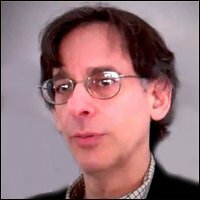 When you can effectively heal by accepting and showing love of your child, traditional child discipline techniques such as withdrawing your love by becoming angry, using threats or bribes become unnecessary. To me the concept of child discipline is obsolete. I simply don't think in that term. All we need is to turn things around in our head: Focus on the acceptance rather than on the behavior. Showing unconditional love is really the most effective way of bonding with your kid. It's almost impossible to withstand the power of the unconditional regard. 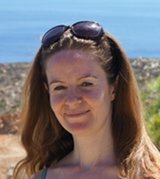 I have now spoken a bit about the potential of using the unconditional parenting as a replacement of traditional child discipline techniques. I would now like to broaden the perspective a bit and talk about the full potential of unconditional positive regard in relation to growth and personal development - of how unconditional parenting paves the way for what is called self actualized human beings. The Unconditional Positive Regard Creates the Optimal Space for Your Kid's Self Actualization! What characterizes the person that you prefer to confide in? Let me give you some clues. He or she is: non-judgemental of you, has a positive and constructive outlook on life, is supportive, shows acceptance of you no matter what you've done! You've searched your memories and found him or her? Now, this is someone who practices the fine art of the unconditional positive regard and probably doesn't even know it. This is someone who accepts you for who you are and it feels no less than great. 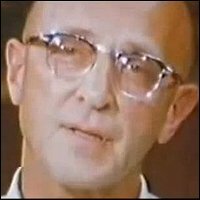 Not being afraid of constant judgement or straining conditions is extremely liberating and healing and according to Carl Rogers makes room for what is called self actualization or living out your full potential. Imagine if you were free to try out whatever you wanted and you were not being afraid of making mistakes. Imagine that no matter what you did, you would still be met with unconditional love. Wow, what a potential for growth! This is why unconditional parenting is long term - the open and accepting attitude allows your kid to experiment in order to find himself or herself. Self Actualization Theory for the Scientifically Interested Parent! • You feel appreciated for the person you are and you are generally empowered by an existential feeling of 'I can!'. When your child is empowered by high self esteem there's a good likelihood that your child will feel free to find his or her true potential and live a life that is dictated by his or her own true interests rather than being a slave to other people's interests and expectations. I know that that is what I want for my child! A Well Meaning Parenting Technique That Lacks the Long Term Focus! Back to the top of this page about The Unconditional Positive Regard - The Long Term Parenting Strategy That Allows for Full Growth!